Temperatures – I needed to carry gear sufficient for temperatures ranging from 20-80° F.
Weather – In the High Sierra, rain is common, and it can snow during the summer months. The socks needed to keep my feet warm, even if they got wet. Washing socks on the trail – being a multi-night trip, I would not be able to carry enough clean socks for the entire hike and would need to do some laundry on the trail. I needed socks that would dry quickly when washed and ideally they wouldn’t need to be washed frequently. Odor – I sweat excessively. While I could use this combo for day hikes, I can’t wear these socks for more than an hour or two of strenuous exercise without them smelling horrible and feeling stiff the next day. We only had a couple of short days planned where it would be possible for me to wash clothes, so I figured I would need to bring 2 pairs of sock liners and 3 pairs of hiking socks in order to meet my needs. I would also need to figure out a good way to attach them to the outside of my pack for drying in the event they didn’t dry overnight. Bulk – 5 total pairs of socks took up a bunch of space in the lightweight pack I wanted to use for my trip. 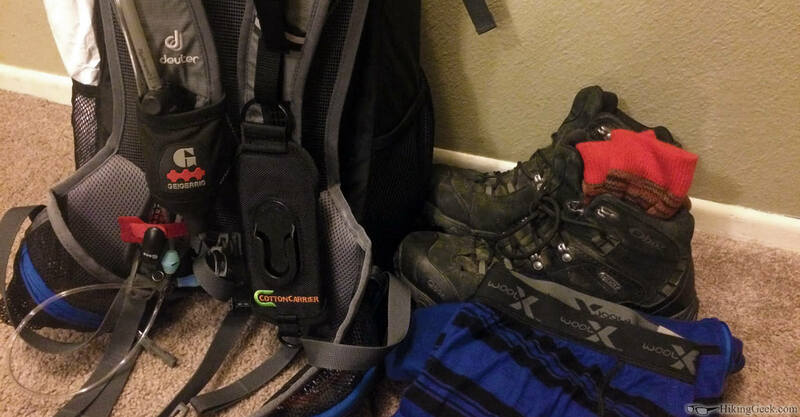 Fewer socks meant less weight and more space in my pack; it would be easier to re-pack each day. Around the same time I was researching what different companies offered for merino wool socks, Farm to Feet (F2F) contacted me to see if I was interested in testing some of their socks. A few days later, I received nice assortment of socks from F2F. To organize my thoughts about the different socks I tested, I have broken them up into three different categories: multisport/everyday socks, hiking socks, and backpacking/mountaineering socks. The observations below include notes from my training leading up to the HST trip, the HST trip itself, hikes completed since returning from the HST, as well as testing at the gym and around the house. Since I received the socks in April, I’ve worn Farm to Feet Socks nearly everyday. The antibacterial and odor resistant qualities of these socks are amazing. If I aired them out at night, I found that I could wear them 3 or 4 long days between washes without them stinking or becoming stiff. They are durable. I really hammered on these 2 pairs of socks. I wore them to work most days for the last 4 months – 8 hours at work, an hour in the gym, 4-5 hours after work, much of it in stocking feet. Merino wool products are expensive, so these socks are pricier than cotton socks. If I could afford to do so, I would replace all of my “everyday” socks with these! Mediumweight with full cushioning throughout. Lightweight with extra bottom-of-foot cushioning. Excels when used with mid or low top footwear in hot weather. Thinner material on top of foot allows feet to breath more. When my Greensboros were dirty, these were the socks that I used for the gym and everyday use. Work well with low-mid top boots, or backpacking boots that don’t have a super-stiff upper. Even with excessive sweating, I have found that I can wear these for a hike one weekend, use them daily at the gym the following week, then hike with them again before I feel the need to wash them. Very comfortable! Usually, I can’t wait to ditch my boots and socks after a hike. My feet feel hot, clammy and wet. This wasn’t the case with these socks. On some of my hikes, I found myself just slipping sandals on after taking my boots off and rocking the ‘socks-in-sandal’ look (My wife would argue this isn’t necessarily a good thing). Thinner and lighter than the thick socks that my feet have become accustomed to while hiking. This left some extra space in my boots (possibility of blisters) and the bottoms of my feet were more sore than normal. It took some trial an error, but I overcame this by adding a cheap insole to take up some of the extra volume in my boot and add more cushioning. This wouldn’t have been as much of a problem if I had used these socks while getting my boots/shoes fitted. 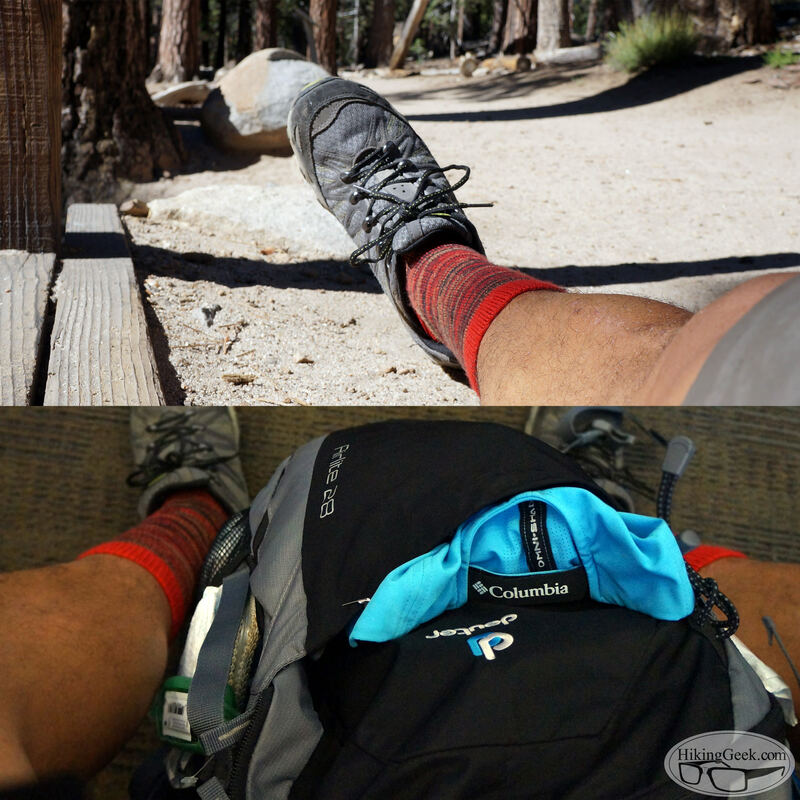 My preferred hiking socks for shorter hikes or for trips that I don’t use my backpacking boots. With long hikes (15+ miles), or hikes with a heavy pack, I use my backpacking boots and I prefer the High Points (notes below). Common occurence at the Duck Pass trailhead - my socks weren't stiff or smelly after my hike, but were very dirty. My favorite socks out of the bunch, primarily because I usually hiked in my backpacking boots during the testing period. Despite my best efforts, and months of trying, I have not been able to make these socks stink or become stiff. In May I wore them on a Half Dome attempt covering 16.5 miles and 11 hours. That following week I wore them daily to the gym. N/A – with the high level of comfort and performance these socks provide, I don’t see any negatives. They are well worth the $25. The BEST hiking/backpacking socks I have ever owned. I bought a pair with my own funds this week. BUY!.. for hiking and backpacking. Farm to Feet gets my highest recommendation. I wore my F2F socks to work, around the house and to the gym most days between April and September 2015. I also wore them for many hikes, not just those pictured/mentioned above and they have held up beyond my expectations. 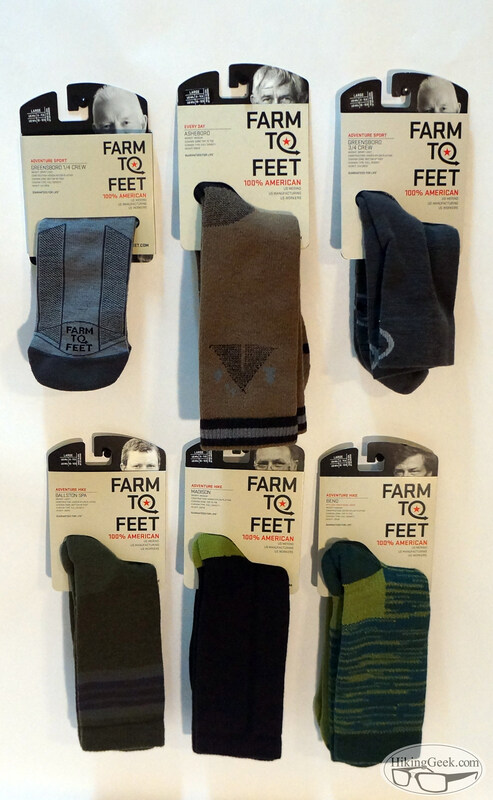 Farm to Feet makes quality products! There’s no way for me to measure this, but I believe that these merino wool socks regulate temperature and/or wick moisture much better than socks that are made from ‘normal’/non-merino wool. I rarely notice my feet feeling hot or sweaty when I am using them which is a common problem with socks made from other materials. While I would consider merino wool an expensive option for everyday use, all of my hiking and backpacking socks will be replaced with merino wool. I may also buy a couple of pairs for gym use. Farm to Feet is 100% American – 100% US materials and manufacturing and are guaranteed for life! Over the years, I’ve tried socks from various manufacturers, as well as different “models” from those manufacturers. F2F makes the best socks I’ve ever used. If money were no object, I would replace all of my socks with Farm to Feet. Disclaimer: The products reviewed in this entry were provided to HikingGeek.com by Farm to Feet . The Diamond Trekkers are listed as a cold weather sock. I see you were able to wear them in July. Are they extra thick like most cold weather socks? Yes, they are thick. I usually hike in heavy backpacking boots, so I prefer socks that have full cushion throughout. How is the sizing on the socks, did they have any stretch? I wear 11.5 or 12 which is the size break for F2F between L & XL. With some brands, the in-between sizing can leave you with a sock that is too tight or too loose. I would recommend a large. I wear a 9 and a medium works best for me. I am running a raffle next month for some F2F socks. I should have details posted soon.